Each year, our artist-in-residence program brings to campus a nationally recognized artist who produces work and teaches a special seminar. The program honors Frances Niederer, a beloved art historian who taught for many years at Hollins. One of the country’s most prominent professors of studio art whose work has appeared nationally in New York, Philadelphia, and Atlanta, and internationally in Russia and Chad, Diane Edison will serve as Hollins University’s Frances Niederer Artist-in-Residence in 2019. Edison, who creates her work using color pencil on black paper, focuses on portraiture with an emphasis on the autobiographical. Her images are thematically narrative in presentation and psychological in nature. 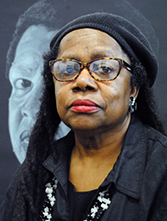 New York City’s Forum Gallery, DC Moore Gallery, and Tatischef Gallery; the Leeway Foundation in Philadelphia; and Clark Atlanta University in Georgia are among the U.S. venues where her art has been exhibited or collected. Overseas, her paintings have been on display in the official residences of the American ambassadors in Moscow, Russia, and N’djamena, Chad. Photographer, filmmaker, and visual activist Zanele Muholi advocates for the LGBTI community and explores black lesbian and gay politics in contemporary South Africa. Her self-appointed mission is “to re-write a black queer and trans visual history of South Africa for the world to know of our resistance and existence at the height of hate crimes in SA and beyond.” Her portraits challenge the stigma surrounding gays and lesbians in South Africa, debunk the common rhetoric that homosexuality is un-African, and address the preponderance of hate crimes against homosexuals in her native country. Susan Lichtman is a figurative painter of domestic spaces. For 30 years she has used her home and family as a source for compositions based on observation and imagination. Her oil and gouache paintings have been exhibited widely, most recently at Swarthmore College, PA; Smith College, MA; and Gross McCleaf Gallery in Philadelphia. She has earned awards from the American Academy of Arts and Letters, the Tiffany Foundation, and from Brandeis University, where she holds the Charles Bloom Chair in the Arts of Design. Tip Toland is a full-time studio artist and a part-time instructor in the Seattle area. Her work is represented in both private and public collections, including Yellowstone Art Museum, Archie Bray Foundation, the Renwick Gallery of the Smithsonian, Kohler Art Center, Nelson Atkins Museum, The Museum of Art and Design, the Crocker Museum, the St. Petersburg Museum of Art, and the Metropolitan Museum of Art. Lisa Bulawsky examines ideas of private life and civic space, which she explores in works on paper, installations, and ephemeral public projects. The Corcoran Gallery of Art, International Print Center in New York, Dalarnas Museum in Sweden, and Opole Contemporary Art Gallery in Poland all exhibit her work. Ben Grasso’s large-scale paintings depict familiar objects such as houses and trees that have exploded and are floating in space. His paintings evoke images that are “coming undone and revealing how [they] might be put together again” (Artforum magazine). Dan Estabrook makes contemporary art using a variety of 19th-century photographic techniques. He balances his interests in photography with forays into sculpture, painting, drawing, and other works on paper. Cameras have always fascinated Beverly Rayner. She creates mixed-media constructions around photographic imagery, often in a sculptural way, using all kinds of photographic materials, either her own or found.